I've noticed that sometimes, people on a date are miserable but feel compelled to stay until the logical conclusion of the activity, whether it's coffee, a meal or drinks. They don't realize that they're free to end the date at any point if they're not feeling it or if they're not having a good time. First dates aren't a favourite of many people. They can be awkward, uncomfortable and even painful at times, as one or both participants sit there wondering what they're doing with this other person. It's common for people to err on the side of being polite, letting the date run its course rather than telling the other person that they'd like to wind things up early. Often, it's just a matter of not feeling like they have a good enough reason to call it quits. People like to give each other the benefit of the doubt. On a date, they tend to want to see the best in each other, even while they're having a not-so-good time. 1. Your date spends more time looking at their phone than talking to you. This is rude, and shows a lack of emotional intelligence. Don't expect things to improve, moving forward. 2. Your date is being flirtatious with the wait staff. Imagine how they'll be if you start a relationship. 3. Your date is being nasty or condescending with the wait staff. It's only a matter of time until they start acting this way with you. 4. Your date has invited you out but then makes a point of complaining about the prices at the bar or restaurant. Being cheap with money indicates that they lack a generosity of spirit as well. 5. Your date spends most of the time going on about their ex. They haven't let go of the past, so they aren't ready to start something new. 6. Your date makes it clear to you that their job, kid or hobby is their number one priority. They're letting you know now that spending time with you is way down on their list. 7. Your date talks and talks about themselves but asks you practically nothing about yourself. This is someone who's so self-involved that you're unlikely to have your needs met if you take up with them. 8. Your date starts peppering you with personal questions that feel like an interrogation. This person has no idea of how to gradually create a meaningful connection. 9. Your date brags, name drops or acts like a boor. They're more interested in impressing you, or eliciting some type of reaction from you, than getting to know you. 10. Your date is creepily over-familiar with you, even though it's the first time you've met. This person has terrible boundaries, so expect them to disregard yours if you continue to see them. 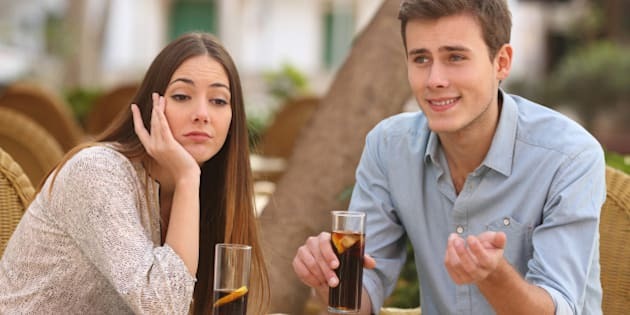 If you're experiencing any of these things on a first date, and especially if you're experiencing many of them, it's probably best to cut the date short and move on to your next first date. For more tips on making the most of dating, check out my new book: Back on the Market: The Grown-up Woman's Guide to Great First Dates... and Beyond. And sign up here for my free monthly wellness newsletter. February is all about love! Take our quiz and find out if your relationship is the real thing.